Are empaths meant to serve in the healing arts or are they too sensitive? Are empaths meant to serve in the healing arts–or are they too sensitive? Answer: Empaths are intuitive, loving, sensitive and make wonderful healers IF they learn how not to take on the stress of their patients. As a psychiatrist I work at this all the time and succeed. There are many techniques that you will need to practice such as grounding, shielding, meditation, and notice what buttons of yours get pushed by your patients–for instance, their depression, anxiety, frustrations–and begin to heal those triggers in yourself. Then you won’t be as prone to absorb other people’s emotions. A meditation I use between patients is to close your eyes. Focus on your breath. Then gently extend your awareness downward to strata, bedrock, minerals, and soil. From the base of your spine begin to feel a continuity with the earth’s core. Picture having a long tail that roots in that center. Allow the earth’s energy to infuse your body and stabilize you. If you meditate for five minutes or an hour this is sacred time. 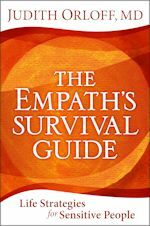 Also check out my CD Becoming An Intuitive Healer which is made for healers and health care professionals of all kinds as well as the chapter in my book, The Empath’s Survival Guide on the best and worst jobs for empaths. There are multiple techniques there that you can practice.